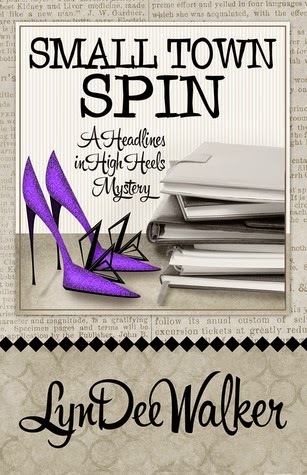 I read a really good book recently, y'all — Small Town Spin by LynDee Walker, the third book in the Headlines in High Heels Mystery series. Let me tell you a little about it. Small Town Spin by LynDee Walker is a great read, involving a serious subject. Through Nichelle's respectful reporting and interviews of the grieving parents, Walker handles the sensitive subject of teen suicide well. Richmond Telegraph investigative reporter Nichelle Clarke is asked by the Telegraph's sports columnist, Grant Parker, to cover the apparent suicide of the son of his friend (a star quarterback). Nichelle uncovers the truth about the death, plus other deaths that follow, and makes some enemies along the way. Interesting subplots include the mystery of the moonshine operation, and a girly bar that is causing quite a commotion in certain circles. LynDee Walker's journalist background is obvious in the details she includes, about such things as the newsroom, the daily conferences with the editor and the reporters, and doing interviews. These details make this series unique, and are part of why I love all the Headlines in High Heels Mysteries. Book four in the series, Devil in the Deadline, will be out January 6, 2015, and I can't wait! Spring always puts me in the mood for new shoes. To be fair, so do summer, fall, and Wednesday. Good Lord. Just Joey's voice on the phone made my toes tingle. Part of me was afraid of his questionable occupation. Another part was just downright chicken of falling so hard for a guy it could never work with. Yet I couldn't stay away from him. Oy. "...You bet I will, ma'am." He tipped his Mathews Eagles baseball cap. Ma'am. I vowed to stop on the way home for new eye cream. He could stay mad 'til I left my house in garden clogs for all I cared. I highly recommend Small Town Spin, which has earned our Five-Kitty seal of approval! Note: The publisher provided a complimentary review copy of this book to me, in exchange for an honest review.